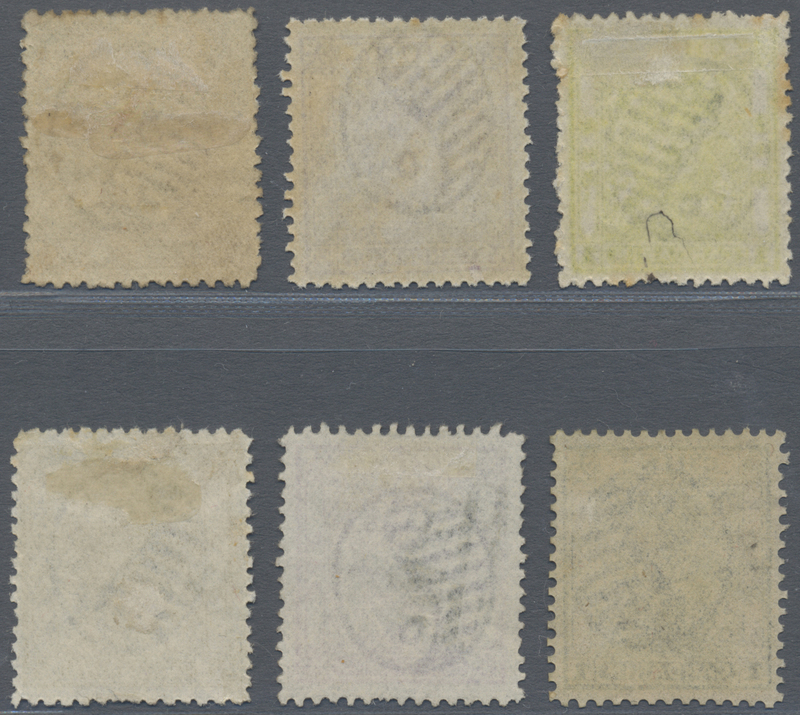 5655 gestempelt (marked) 3III 1885, large dragon rough perforations 5 Ca. lemon canc. "CUSTOMS CHINKI(AN)G JUN 25 86", one pulled perf., clear strike. 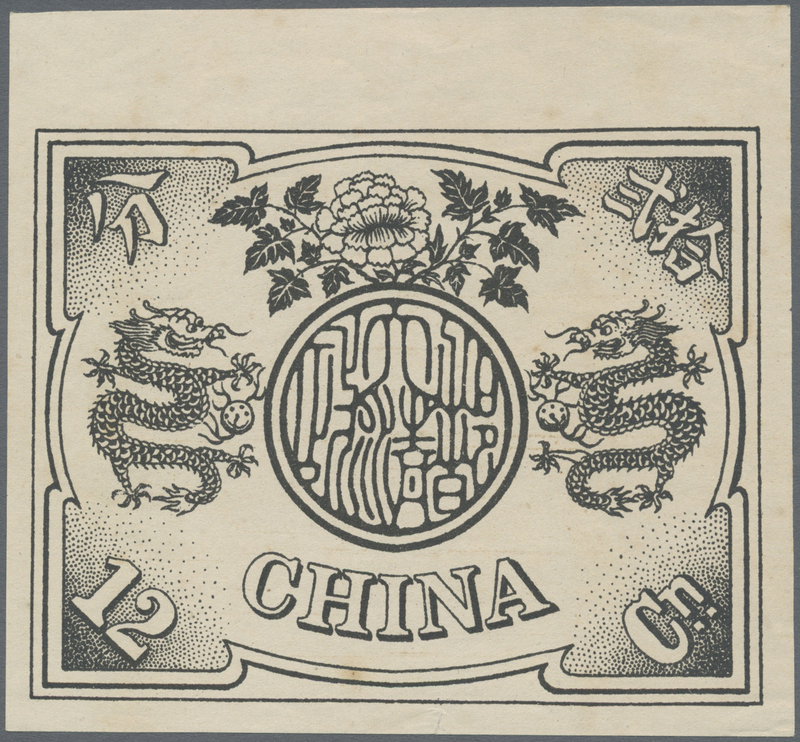 5657 gestempelt (marked) 3III (3) 1883, large dragon thick paper 5 Ca. 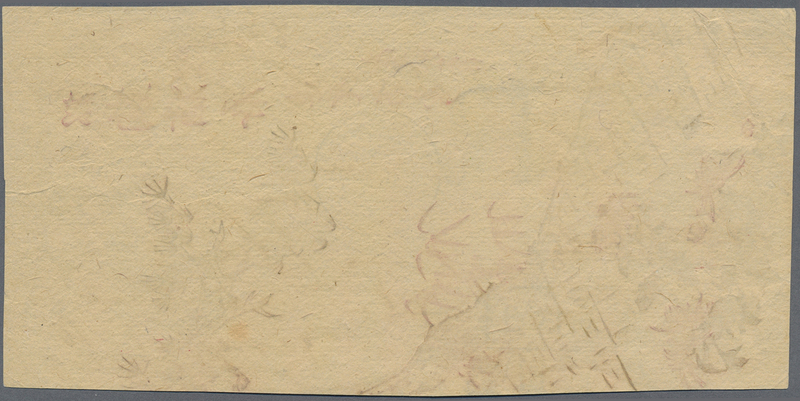 yellow, three used copies with part strikes, a. o. dater "NEWCH(ANG)"; Michel cat. 1350.-. 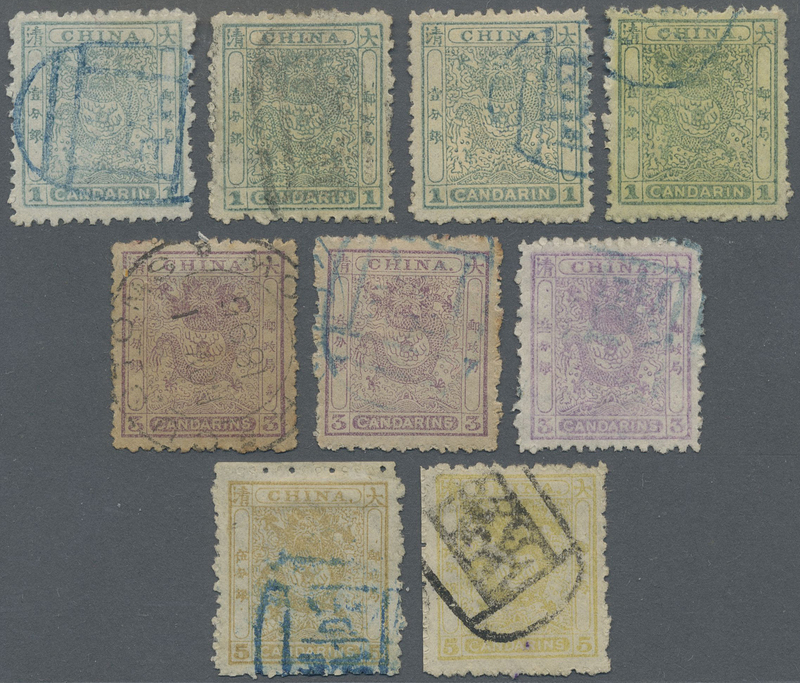 5660 Ansichtskarte (Picture postcard) 4-6, 7 + Kiautschou 1888/92, small dragon complete set with dowager 1 Ca. 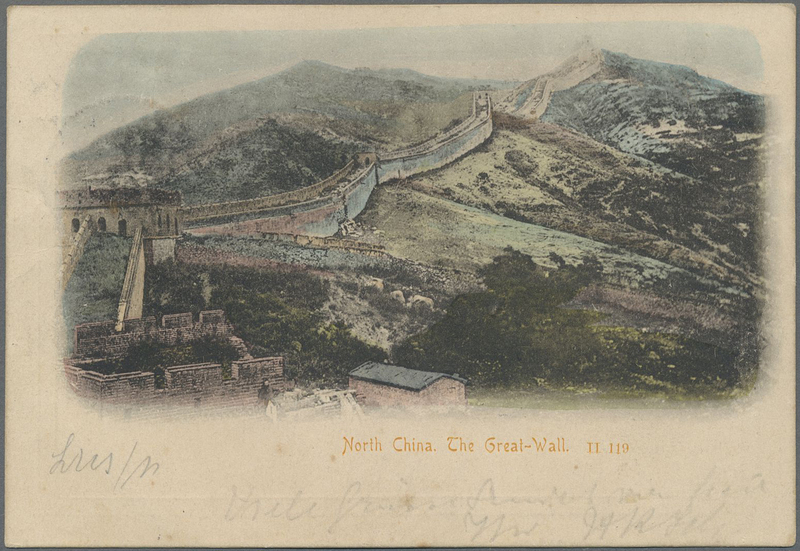 tied oval bilingual "KIAOCHOW OCT 8-1901" to registered ppc (North China: The Great Wall) in combination w. Kiautschou 25 Pf. 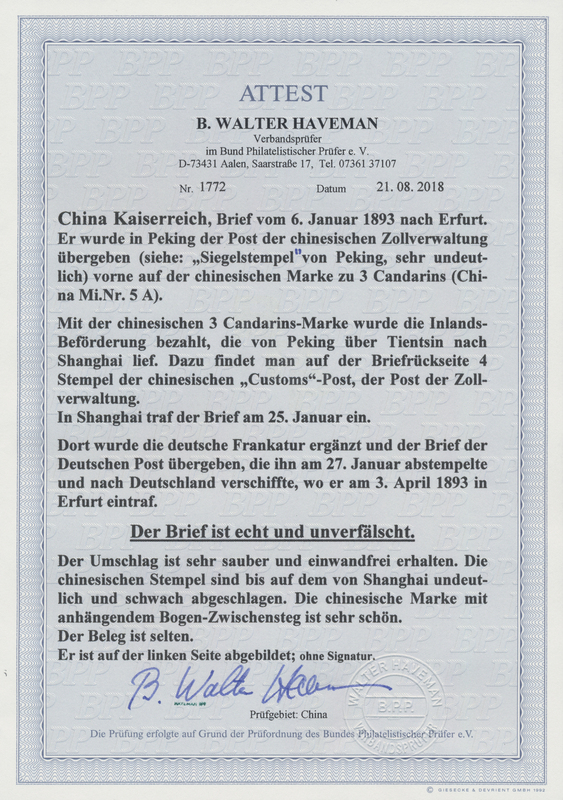 tied "TSINGTAU 9/10 01" to Germany with two arrivals of Nov. 16, attractive. 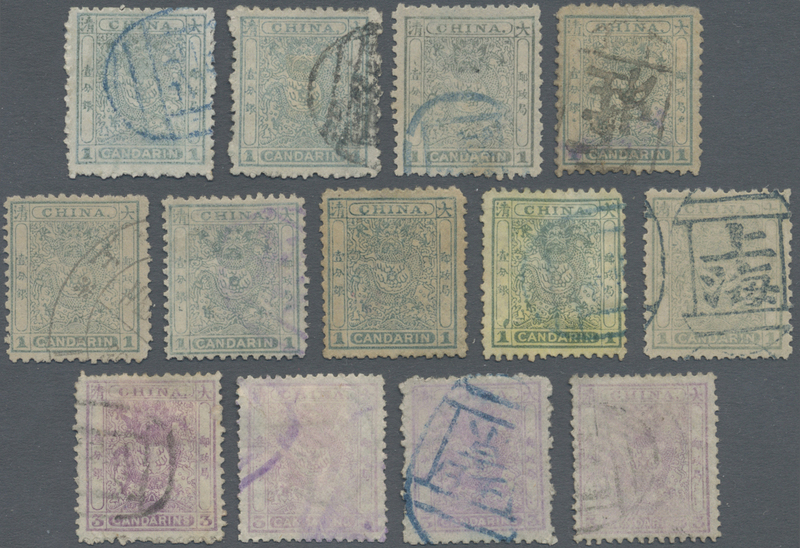 5661 gestempelt (marked) ungebraucht (hinged) * 4/29-ex 1885/1912, group of 8 mostly used inc. small dragons cpl. 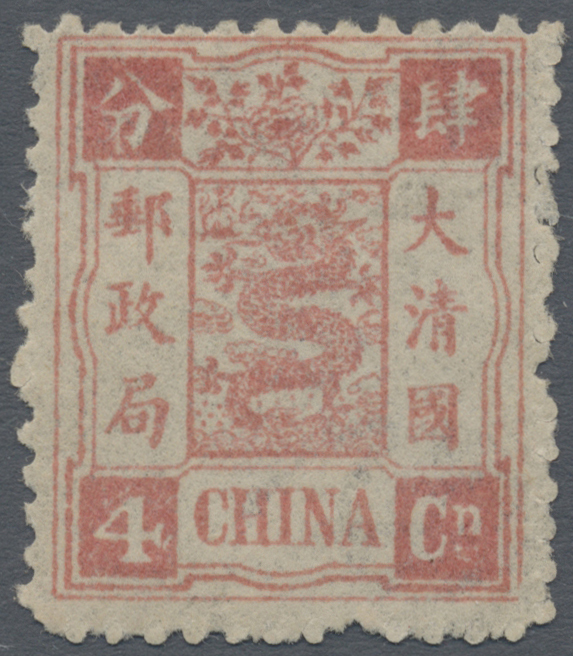 and red revenue 1 C. canc. 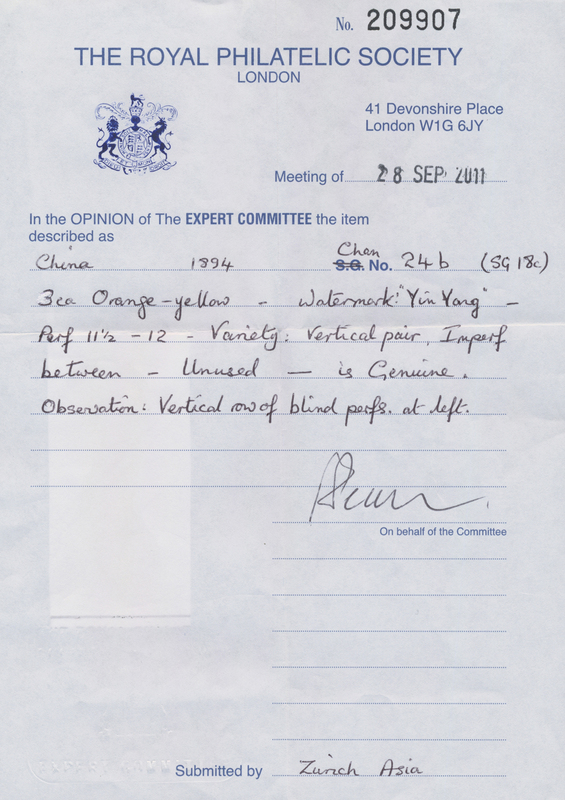 "CUSTOMS (FOO)CHOW APL 17 97". 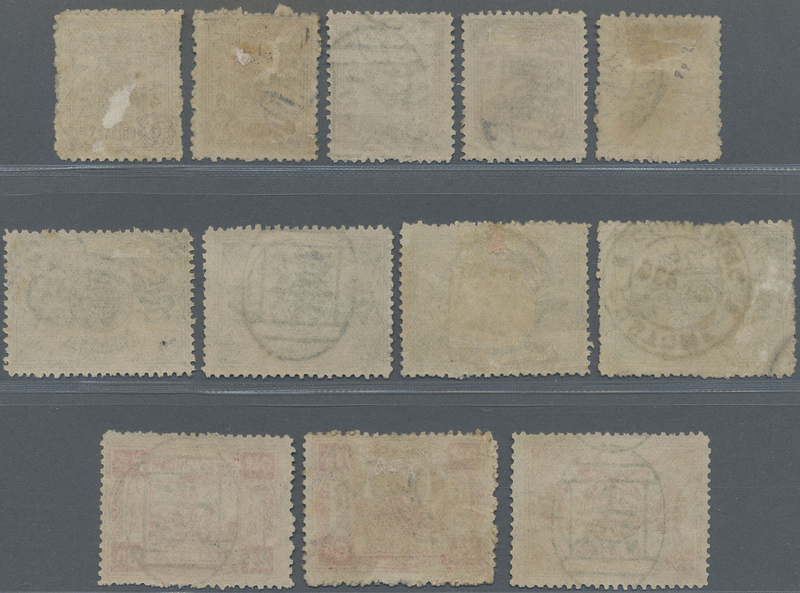 5662 gestempelt (marked) 4A/6A-ex 1885, small dragon rough perf. 12 1/2, used study of 1 Ca. 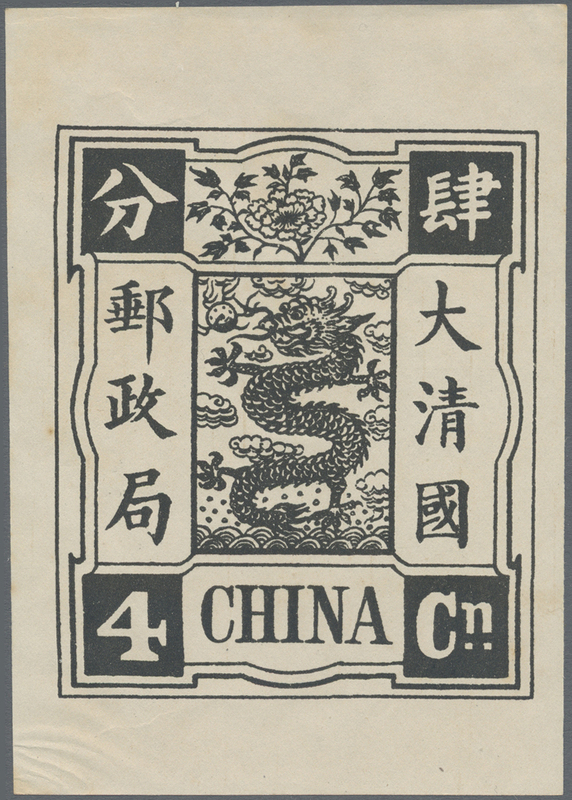 (4), 3 Ca. 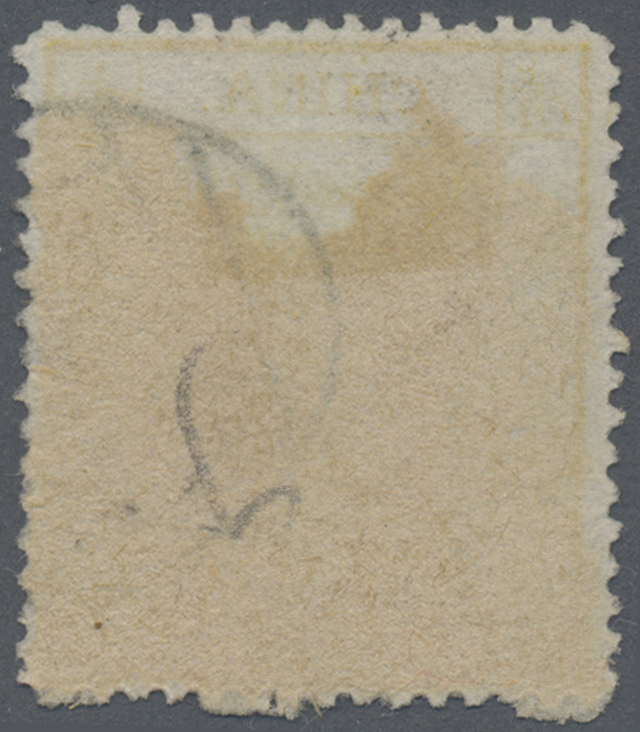 (3 inc. "CUSTOMS H(ANK)OW NOV 1 1895") and 5 Ca. 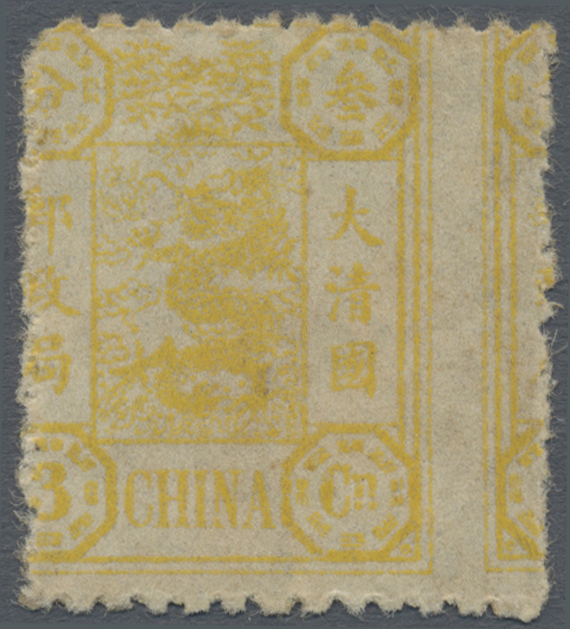 olive yellow (5 inc. vertical strip-3 with two full strikes of blue seal "Peking"), Michel cat. ca 845.-. 5663 ungebraucht (hinged) * 4A (3), 5A, 6A 1885, small dragon rough perf. 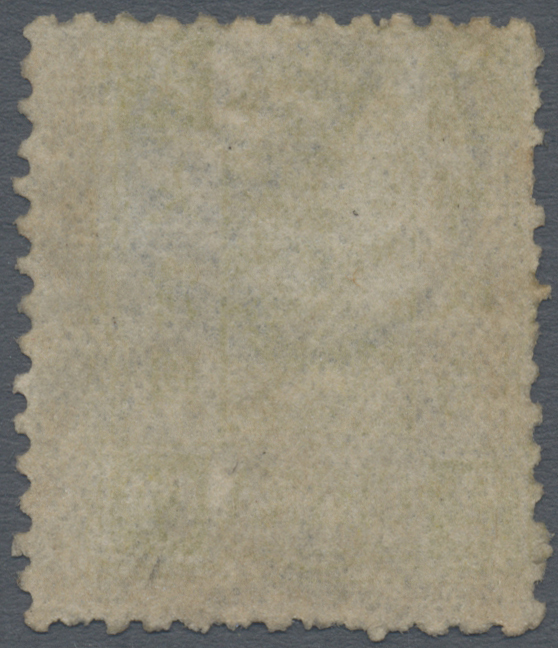 12 1/2, 1 Ca. 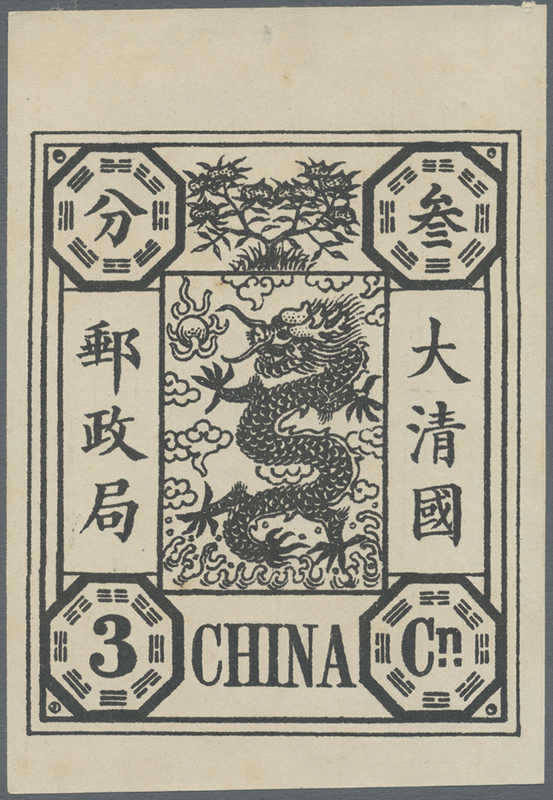 (3), 3 Ca. and 5 Ca. 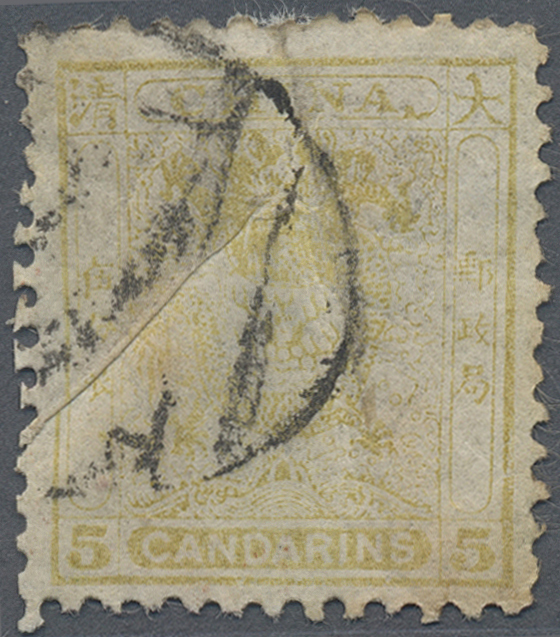 olive yellow (broken frame at "N" of "CANDARINS"), unused mounted mint (Michel cat. 740.-). 5664 gestempelt (marked) 4A/6A-ex 1888, small dragons perf. 11 1/2, 1 Ca. 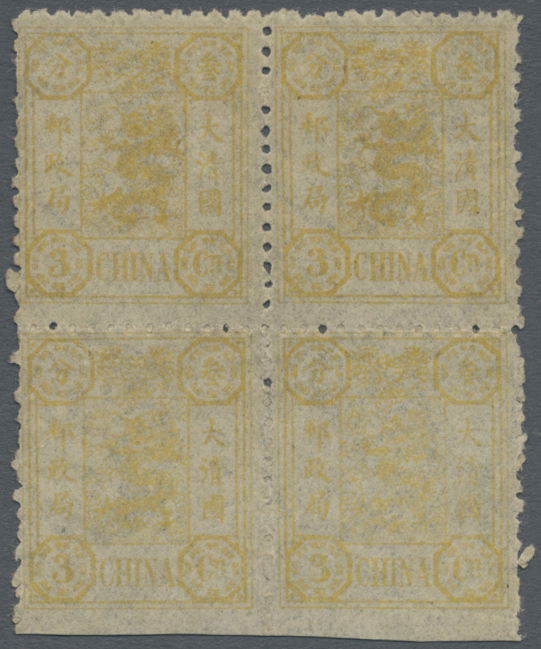 (6 inc. re-entry of top and right frame), 3 Ca. 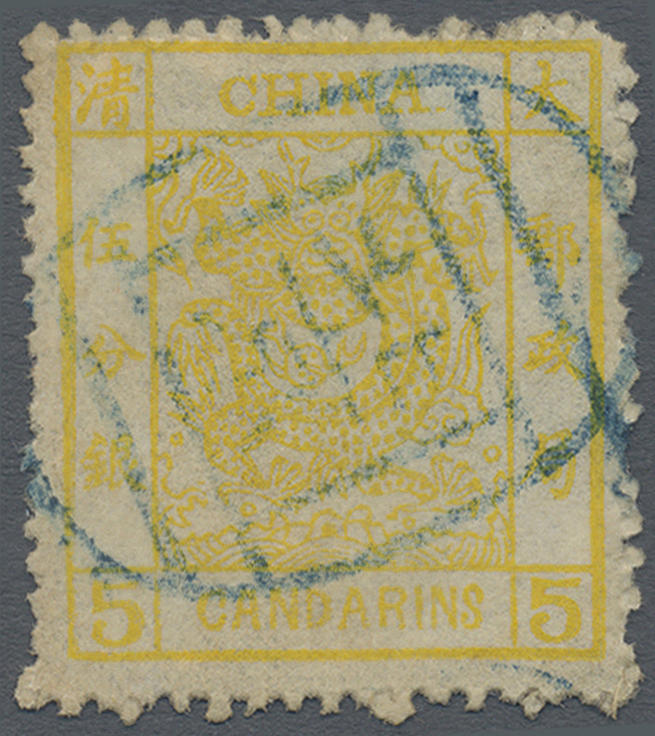 (4), 5 Ca. 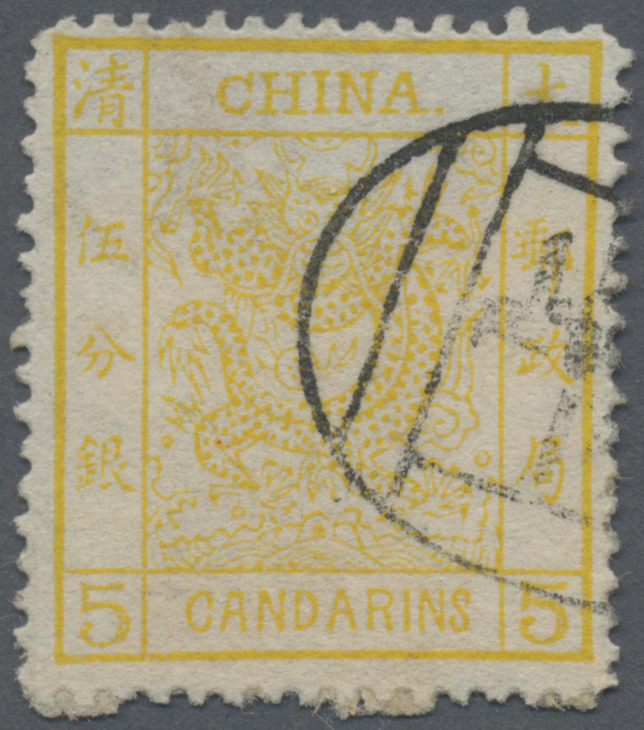 (3, inc. seal "Ichang" and var. 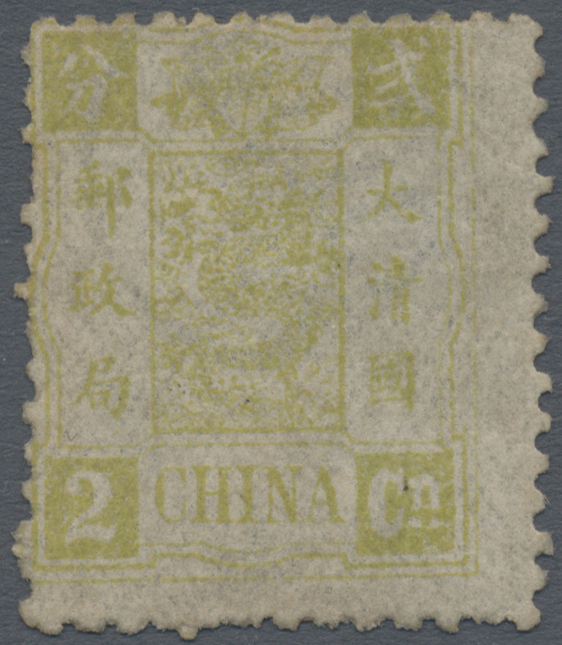 "broken frame top left", Chan 21a), used. Total 13 copies (Michel cat. 740.-). 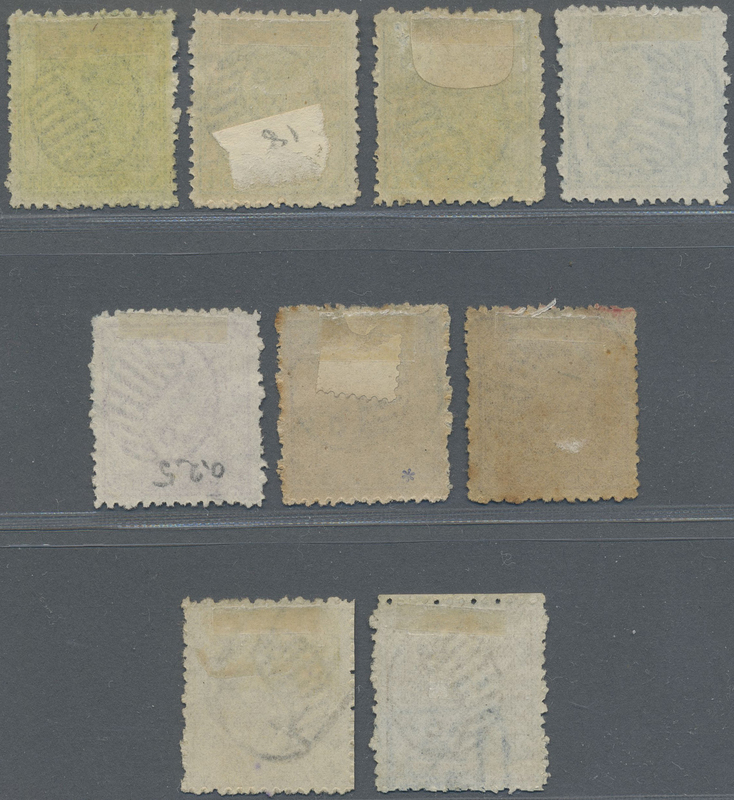 5665 ungebraucht (hinged) * 4C (4), 5C (2), 6C 1888, small dragons perf. 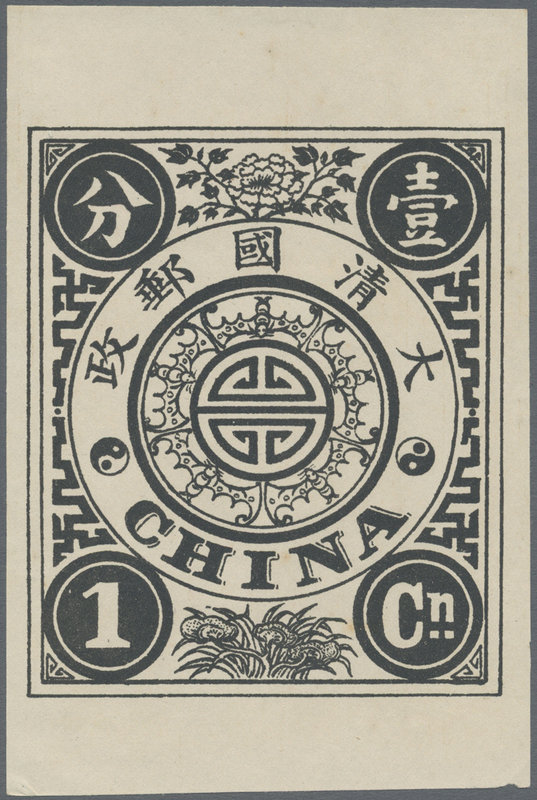 11 1/2, 1 Ca. 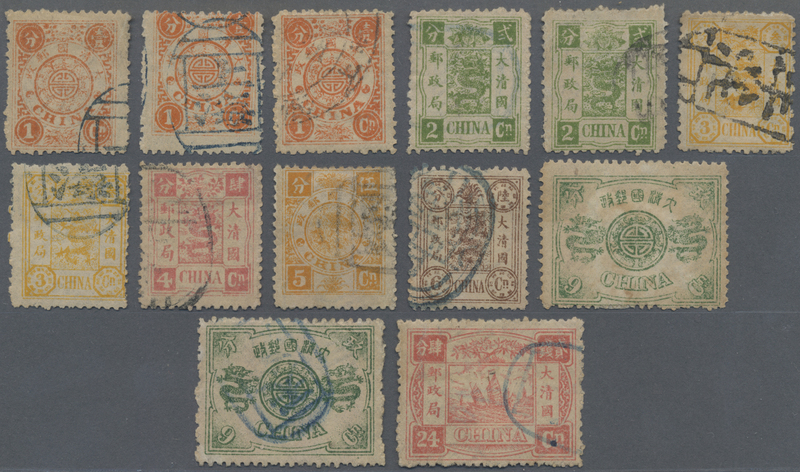 (4 inc. variety "broken frame at left", Chan 19b), 3 Ca. 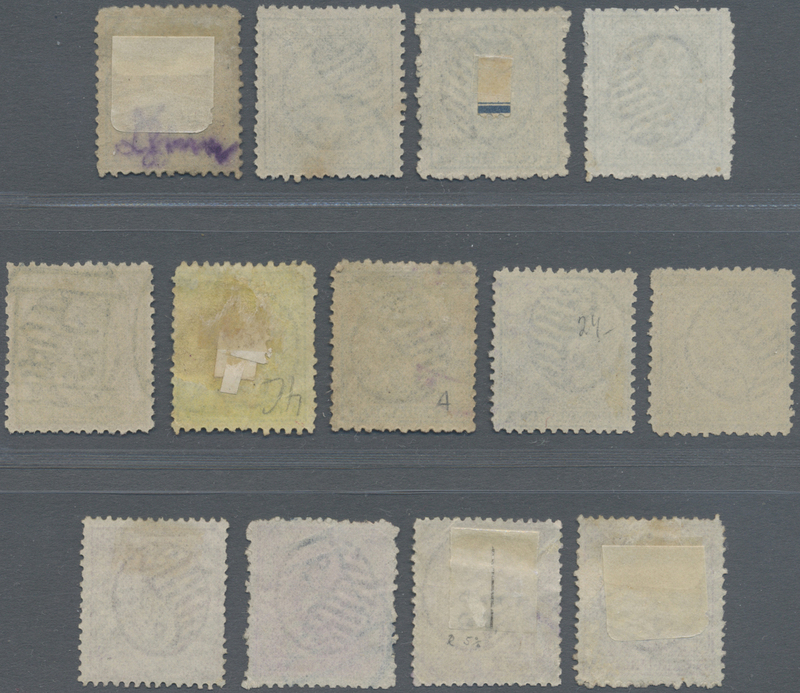 (2), 5 Ca., unused mounted mint (Michel cat. 660.-). 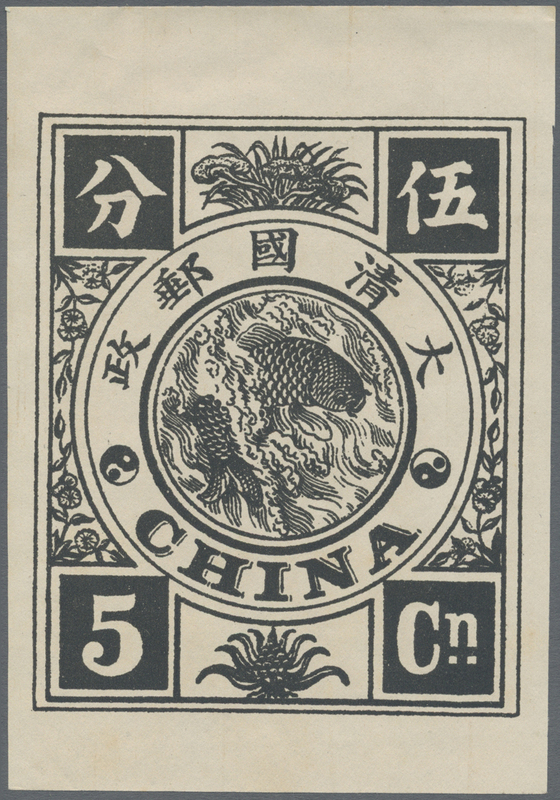 5666 ungebraucht (hinged) * 5A 1885, small dragon 5 Ca. 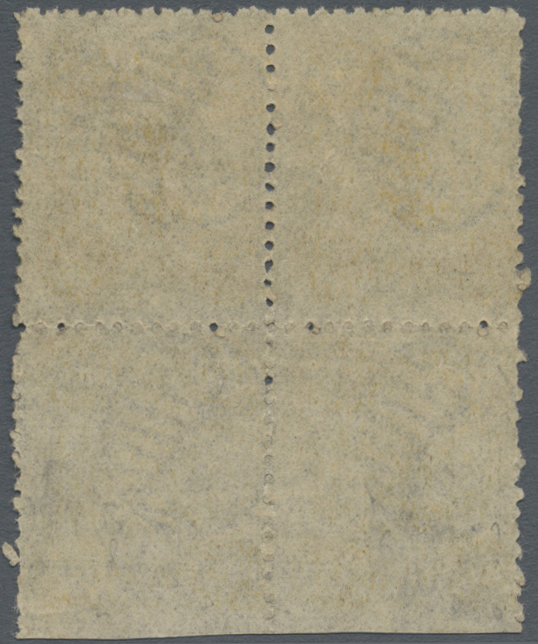 violet, a horizontal pair, unused mounted mint LH, horiz. gum crease (Michel cat. 440.-). 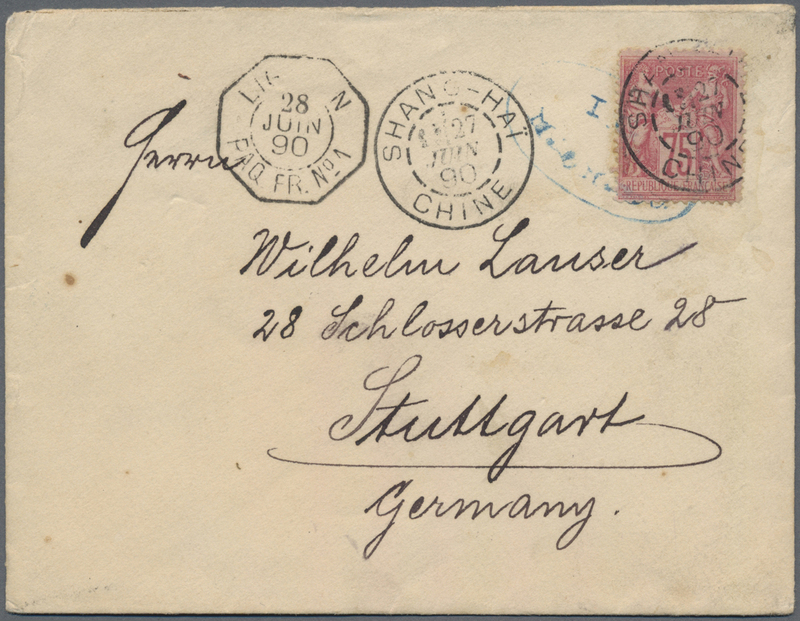 5667 Brief (cover) 5A + Germany 1885, small dragon 5 Ca., a right gutter copy tied faint blue seal "Peking" in combination with german offices forerunner 20 Pf. 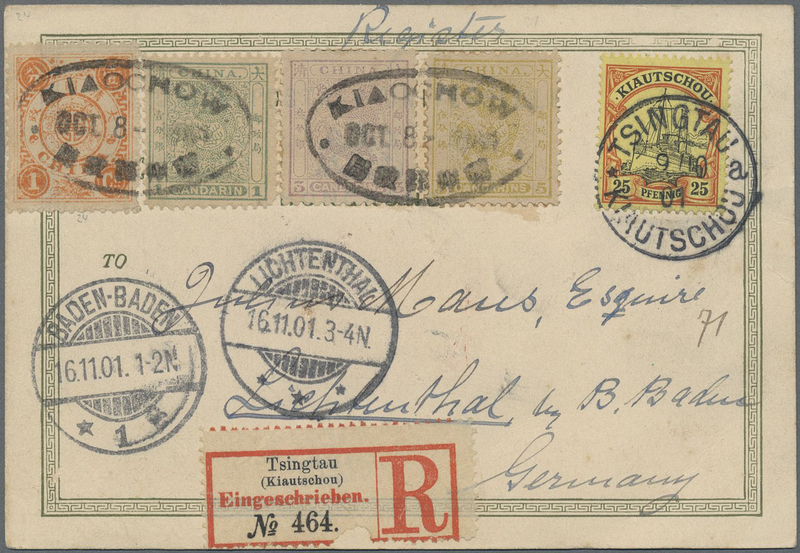 tied "KDPA Shanghai 27 1 93" to cover to Erfurt/Germany, on reverse blue "I.G. 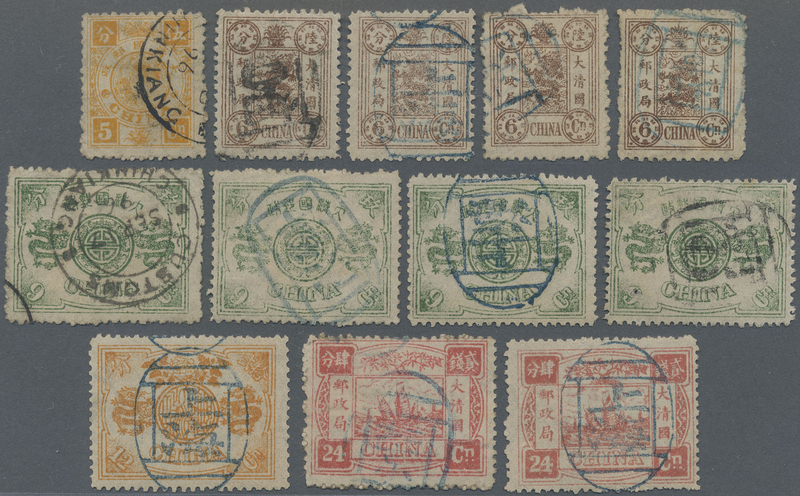 OF CUSTOM(S) JAN 5 93" of Peking, two of Tientsin inc. "JAN 7 93", "CUSTOMS SHANGHAI JAN 25 1893" and arrival "ERFURT 4 3 93", cert. Haveman BPP (2018). 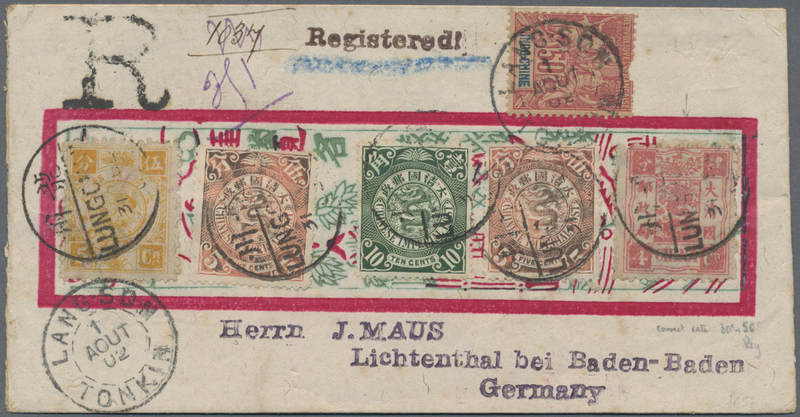 5668 Brief (cover) 5b (2) + Germany 41 1888, 3 Ca. 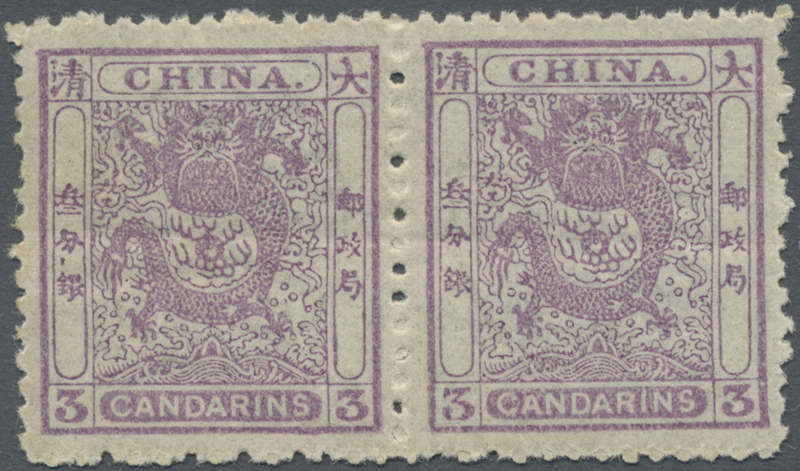 violet, a vertical pair, top margin imperforated, tied oval blue seal "Tientsin" to cover in combination with Germany offices forerunner, 1880 10 Pf. 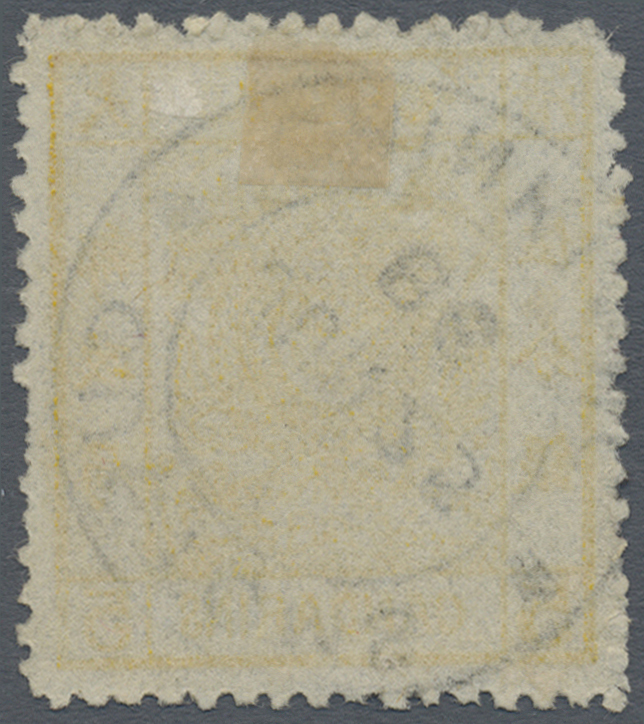 (pair) and 1889 20 Pf. 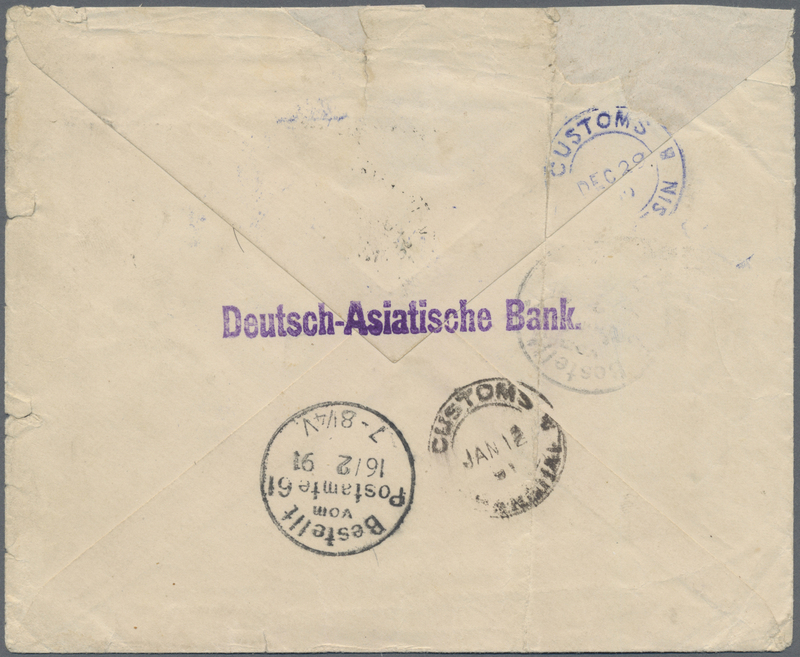 tied "KDPA SHANGHAI 13 1 91!, on reverse customs dater in blue "(TIEN)TSIN DEC 29 90" resp. 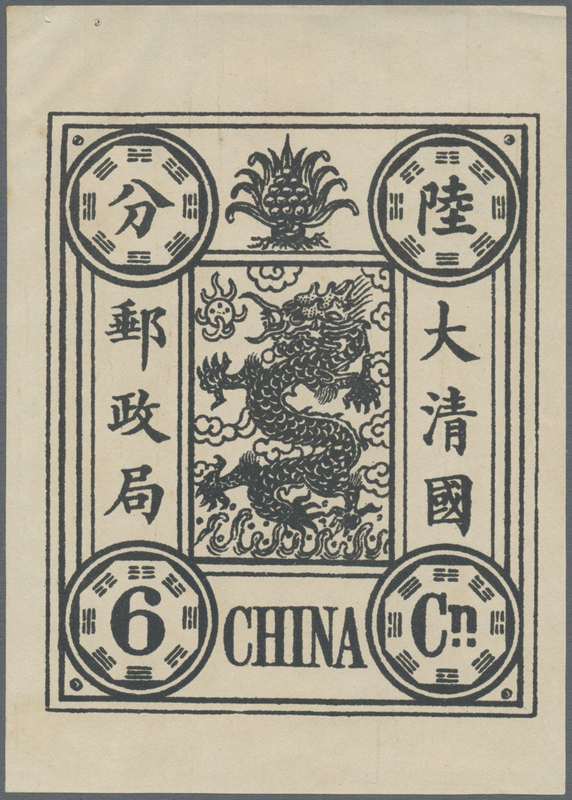 in black "(SH)ANGHAI JAN 12 91" and Berlin arrival of Feb 16, 1891. Both dragons are repaired. 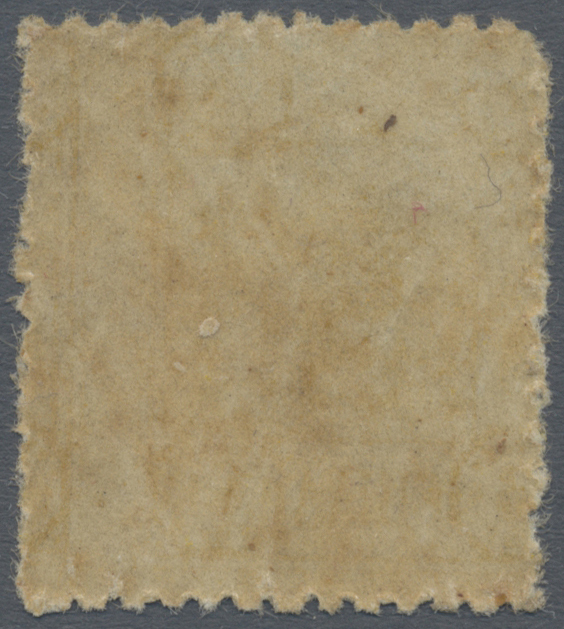 Cover two vertical folds and tears at top and right. 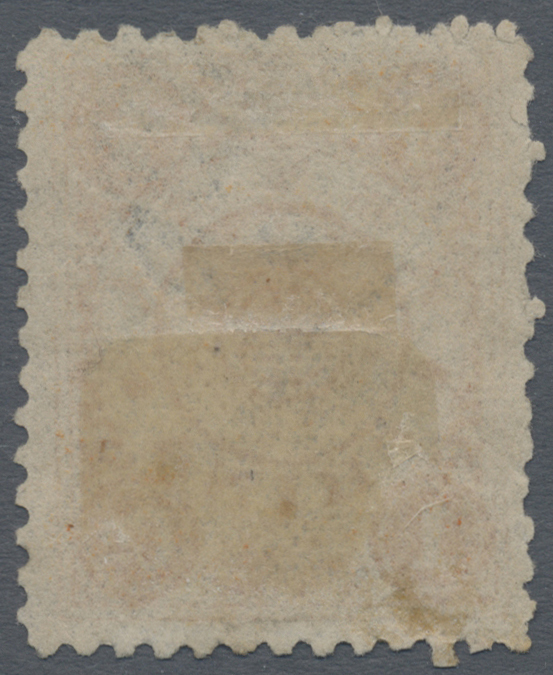 A scarce double weight usage. 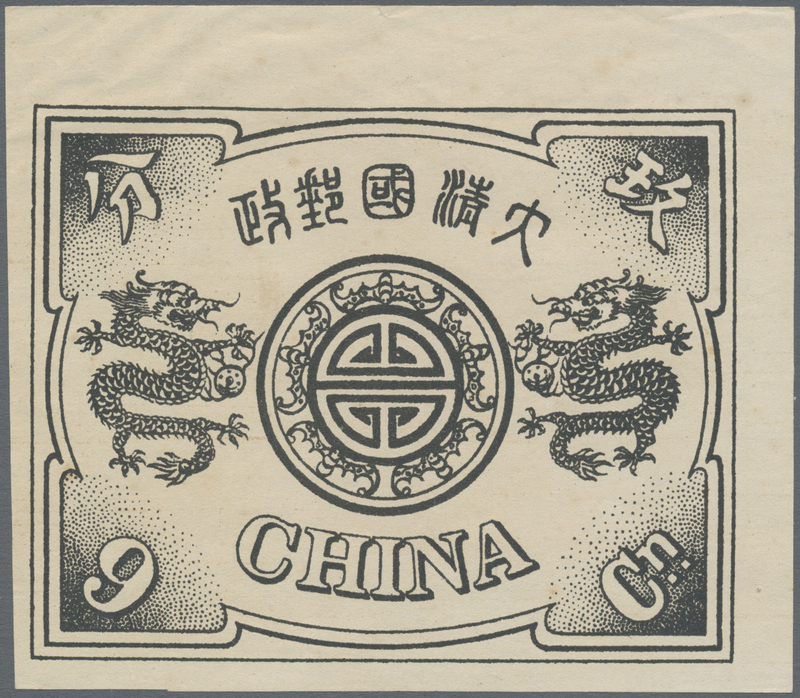 - Small dragon top margin imperforated on cover is exceedingly rare, less than 5 covers recorded. 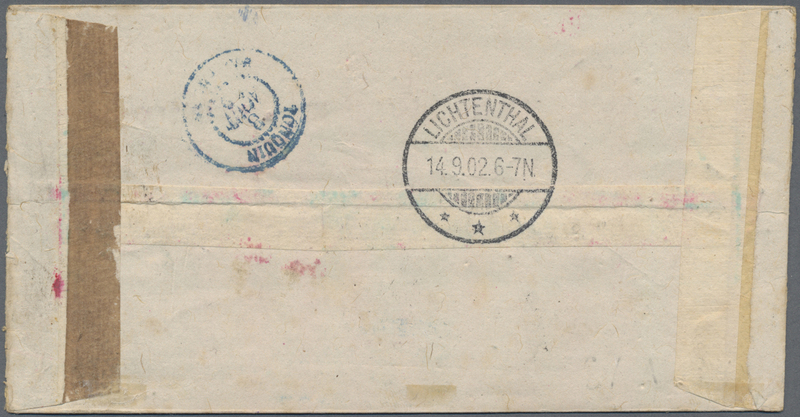 5669 Brief (cover) 5b + Germany 48 1888, 3 Ca. 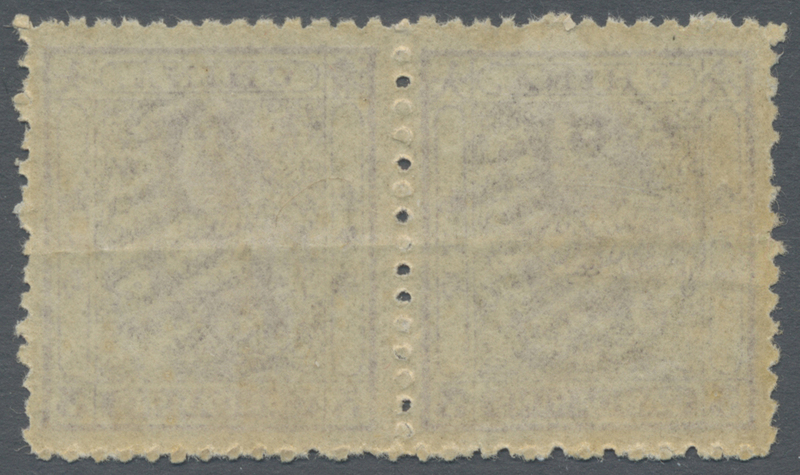 violet, a right margin copy, tied seal "Tientsin" to inbound cover from Berlin/Germany, 20 Pf. 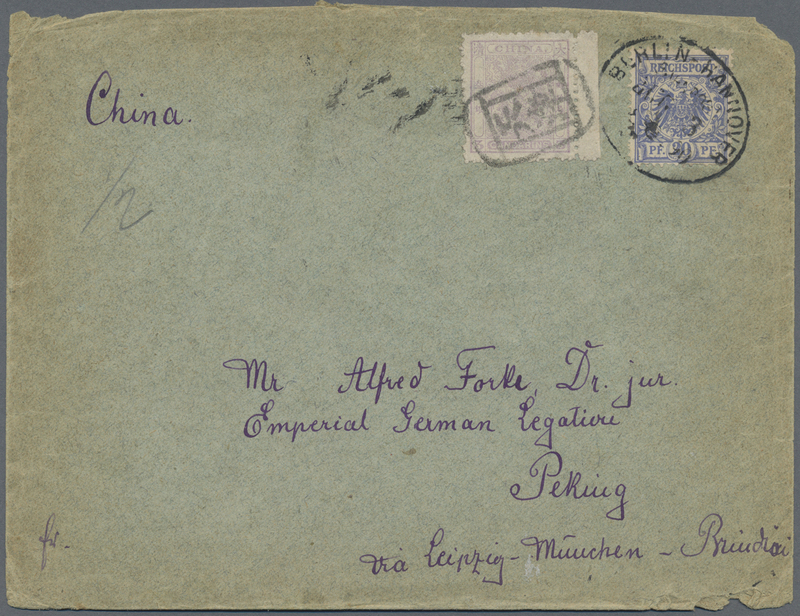 blue tied oval TPO "BERLIN-HANNOVER 2/8 90 ZUG 3" to staff of German Legation Peking, on reverse transits Shanghai German p.o. Sept. 14 resp. 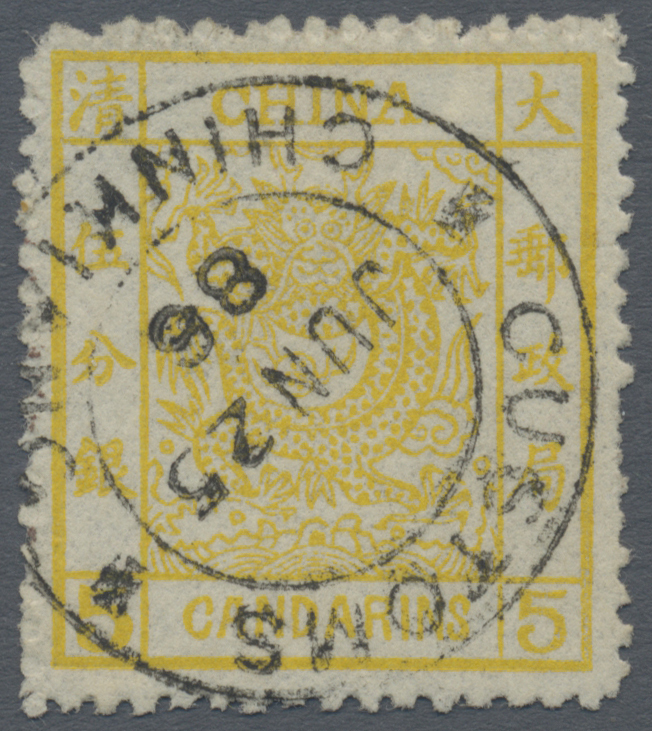 violet "CUSTOMS TIENTSIN SEP 20 90", cover bumped margins and slight corner faults. 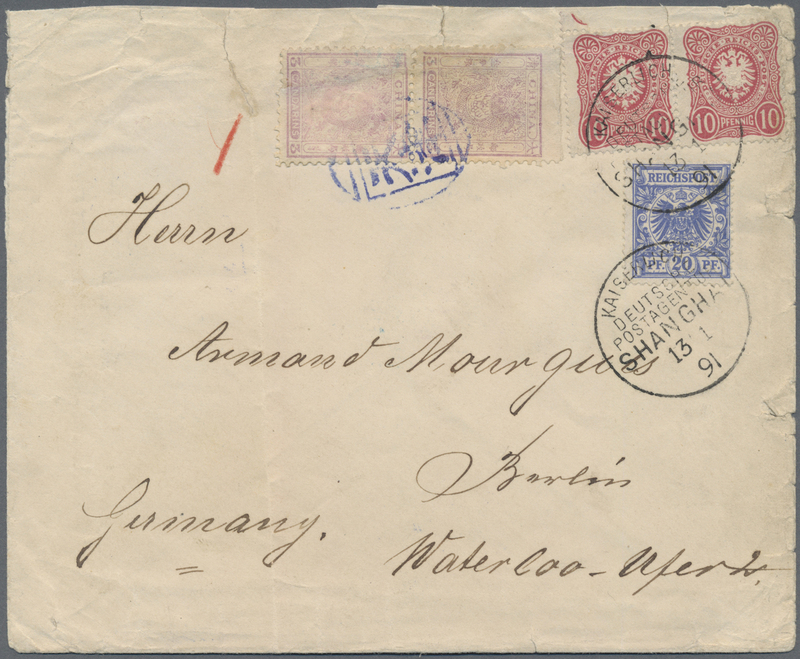 5672 Brief (cover) Min-Chu (letter agencies): 1890 (ca. 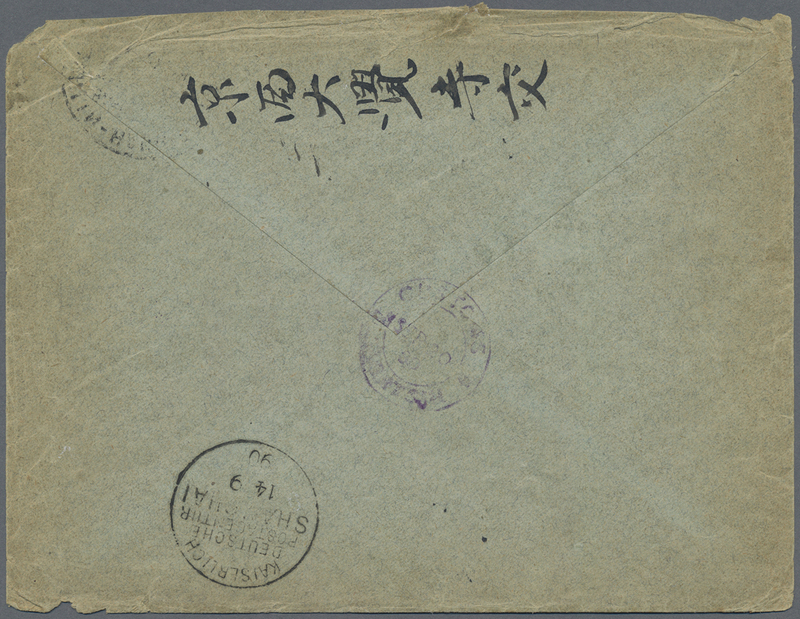 ), illustrated envelope with contents Soochow to Shanghai w. on reverse vermillion vertical s. l. "Soochow / Paochun letter agency". 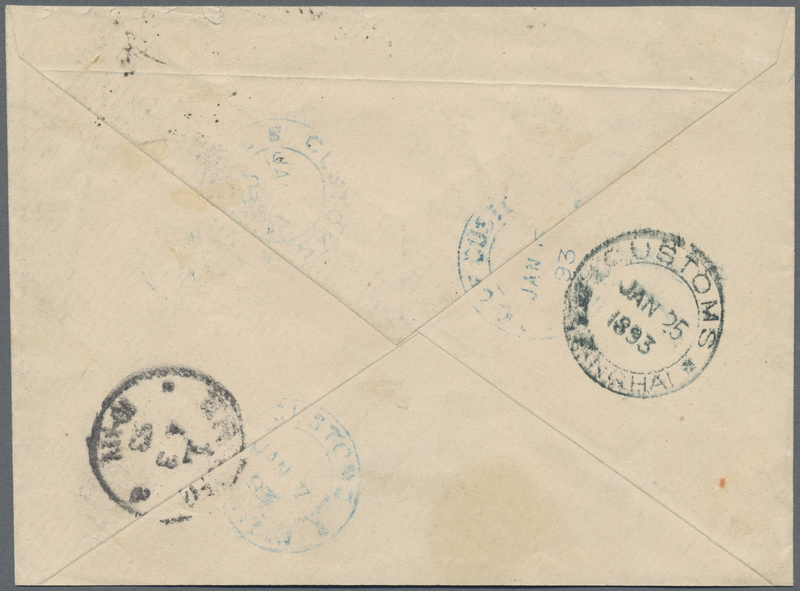 Plus red band envelope Hankow to Shanghai w. on reverse vermillion vertical s. l. "Hankow... letter agency". Two covers. 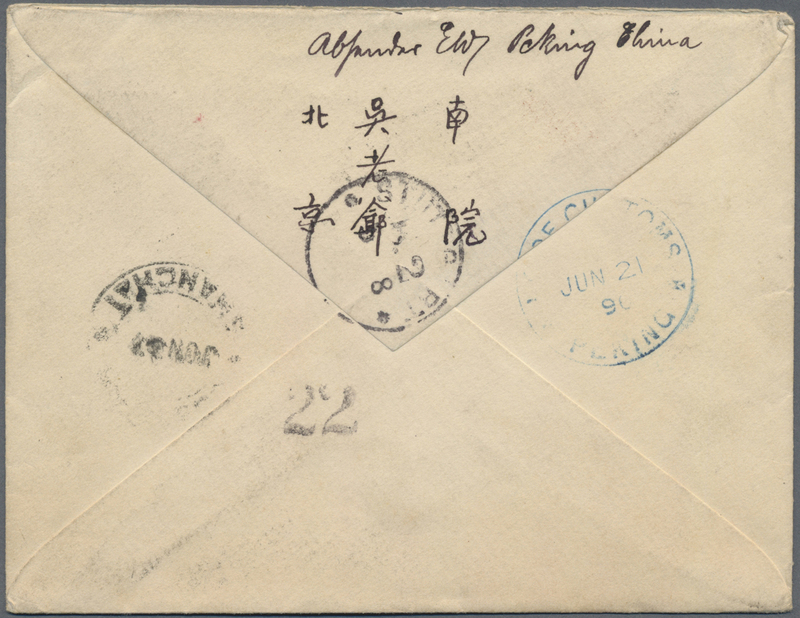 5673 Brief (cover) 1894, illustrated envelope converted to wrapper usage w.on reverse blue "CUSTOMS SHANGHAI NOV 2 1894" in combination w. french offices 5 C. tied "SHANG-HAI 2 NOV 94" to Bergen/Norway, cover soiling, very scarce destination from China. 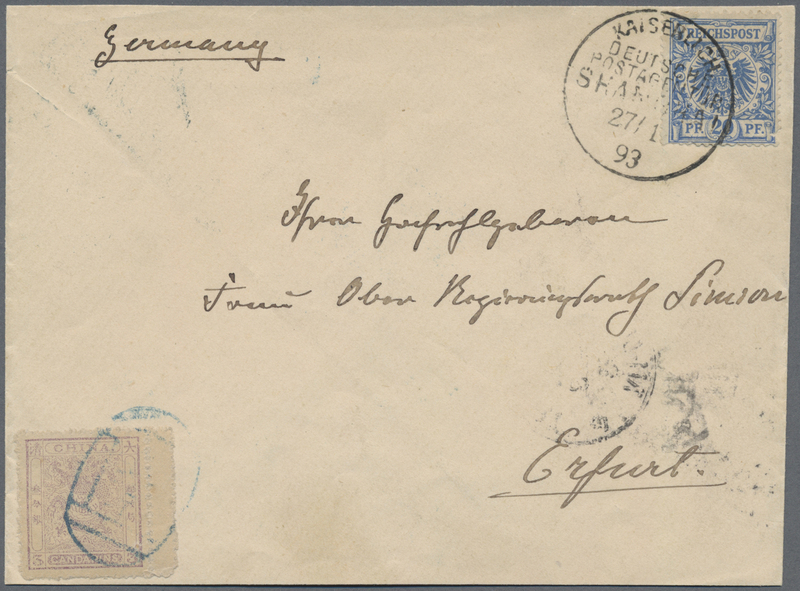 5674 Briefstück (on piece) Brief (cover) 1897, bilingual brown "PAID" and bold brown "R" on large part of registered front cover with blue "I.G. 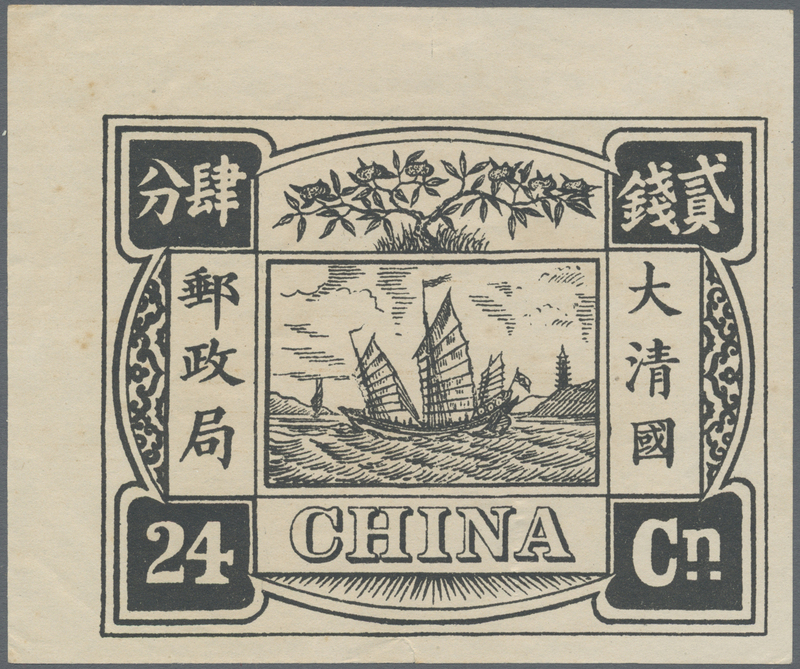 OF CUSTOMS APL 24 97 PEKING" in combination with french offices 50 C. tied "SHANG-HAI 30 AVRIl 97" to Vienna, attractive. 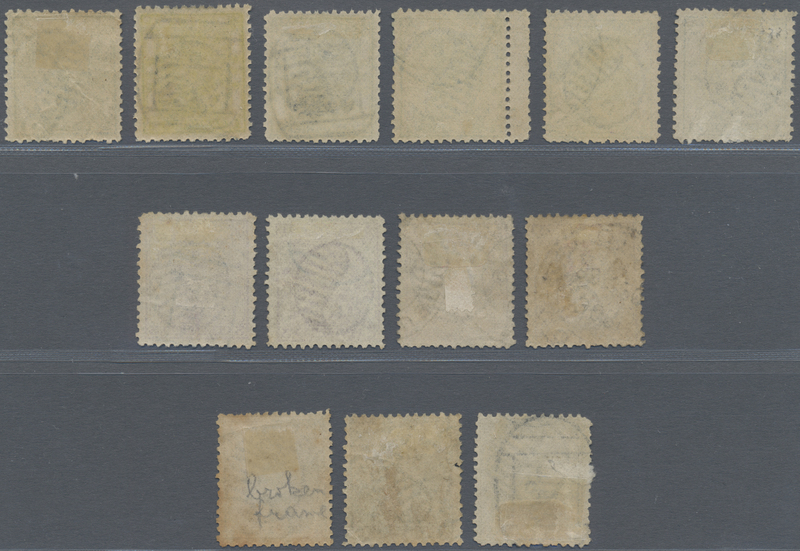 5675 ungebraucht ohne Gummi (unused without gum) (*) 7-15 Pr. 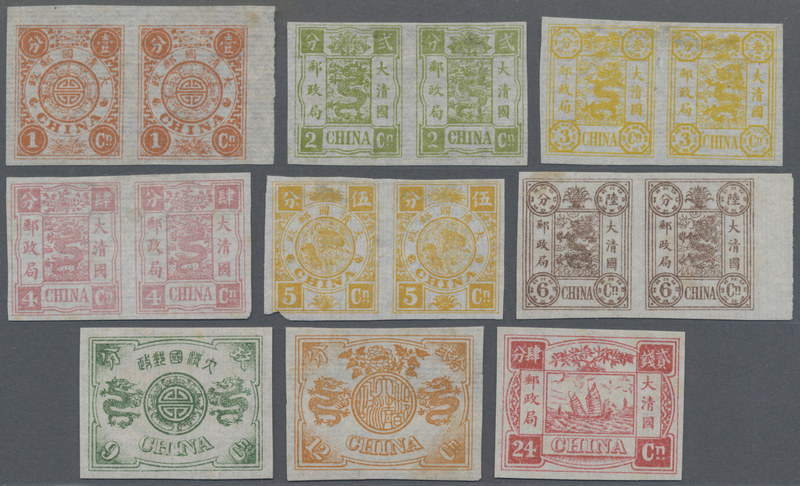 1894, proofs: Dowager set 1 Cn.-24 Cn. 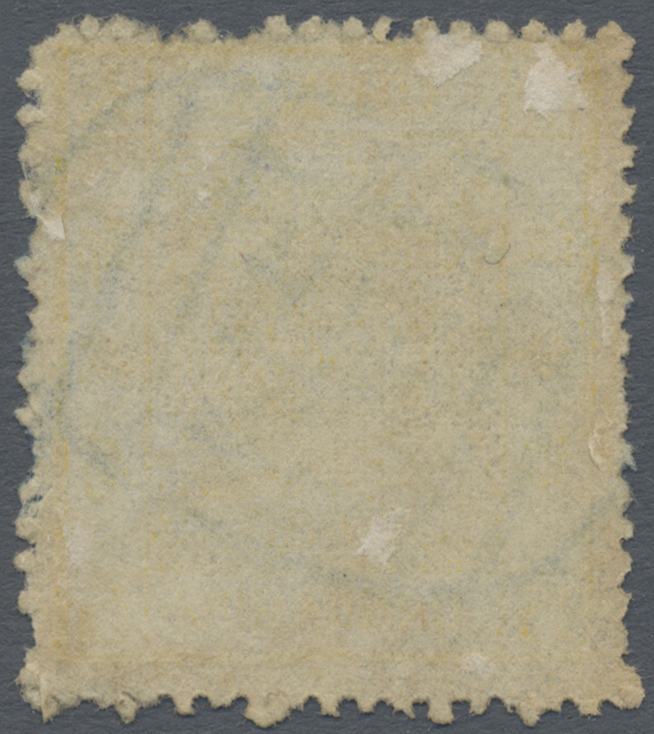 imperforated on very thin "chigarette" paper (Chan poofs 2. 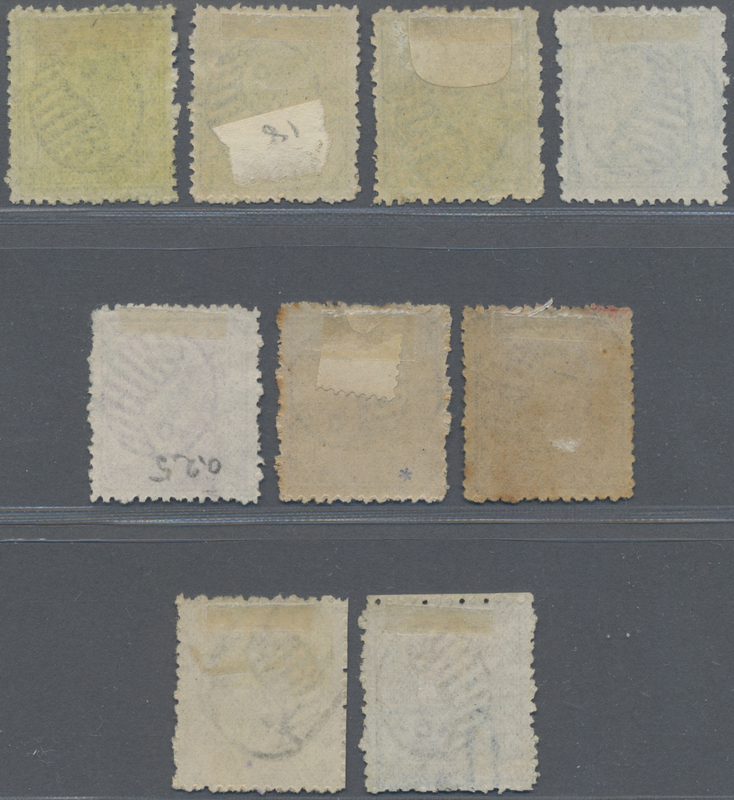 ), the small sizes in horizontal pairs, unused no gum. 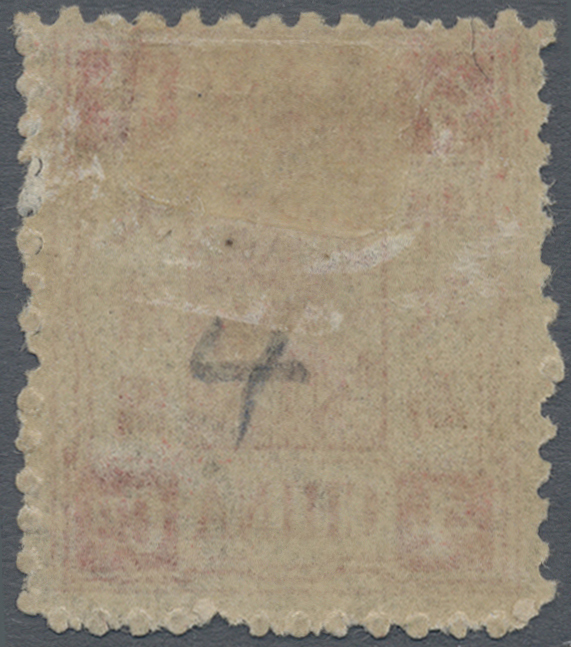 5676 ungebraucht (hinged) * 7-15 Moe. 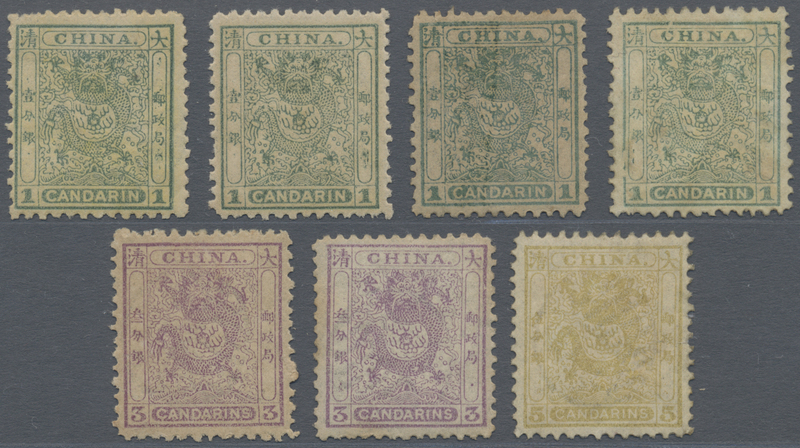 1894, Moellendorf printing Dowager set 1 Cn.-24 Cn., unused mounted mint first mount LH, 6 Cn. signed Hille BPP. 5678 gestempelt (marked) 7/15 1894, Dowager first printing set 1 Cn.-24 Cn., all used blue seal script writing seal of Shanghai. 5679 1894, dowager, about 9 times enlarged black prints on ungummed unwmkd. western paper, cpl. set 1 Cn.-24 Cn., small size vals. 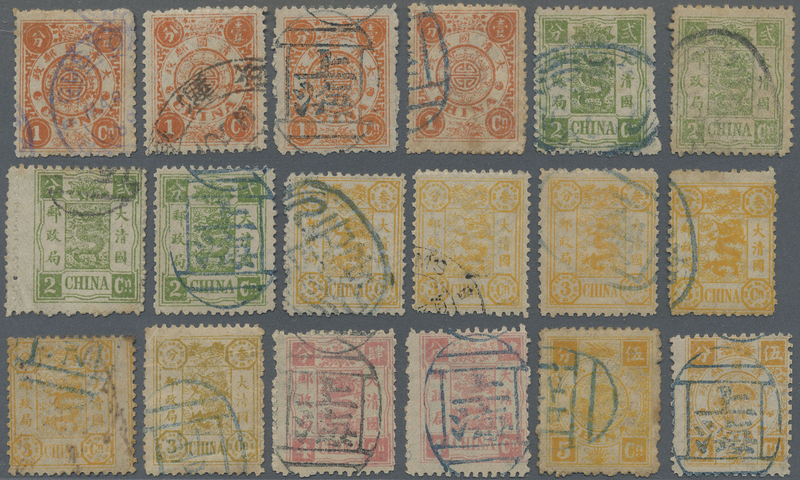 75.6x96mm, large size vals. 113x90 mm, no prints of the period but later reproductions. 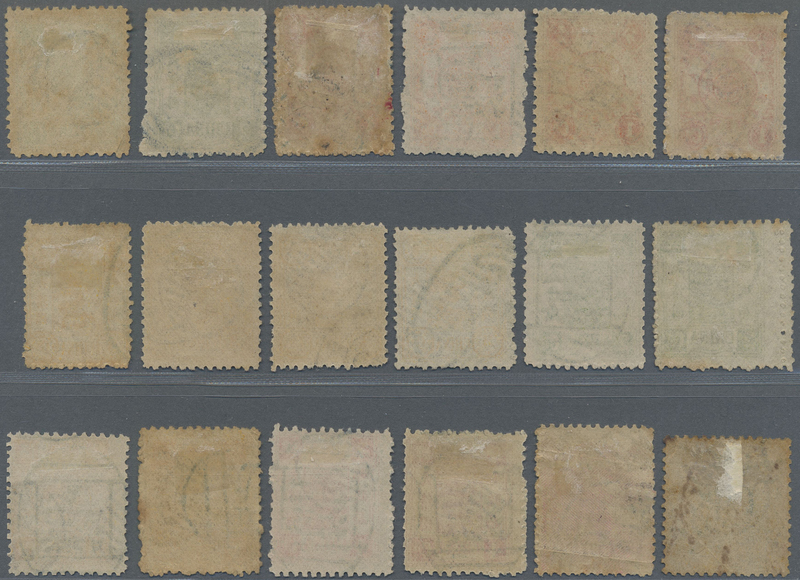 5680 ungebraucht (hinged) * 7a/15a 1894, dowager set 1 Ca.-24 Cn., unused mounted mint, the 2 Cn. 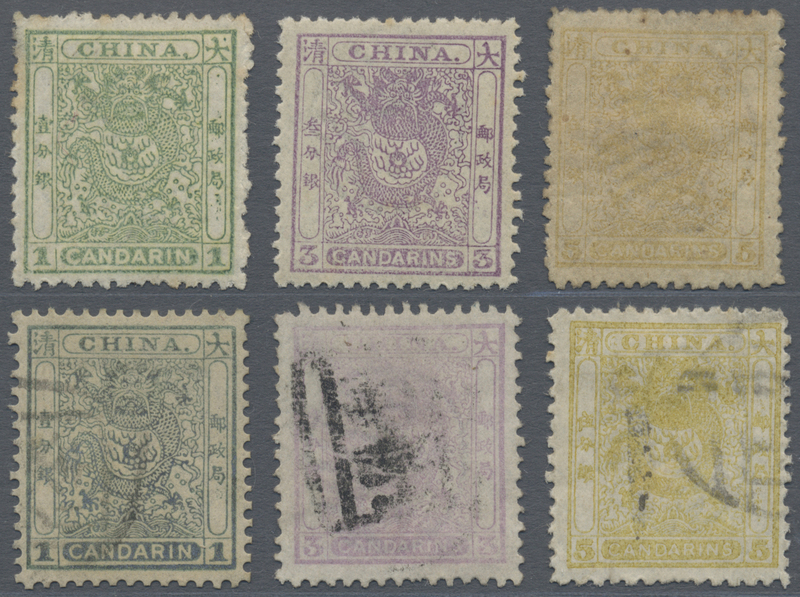 with variety "broken lower frame", plus a second normal copy of the 2 Cn. which is NG, the 24 Cn. partial gum (Michel cat. 2695.-). 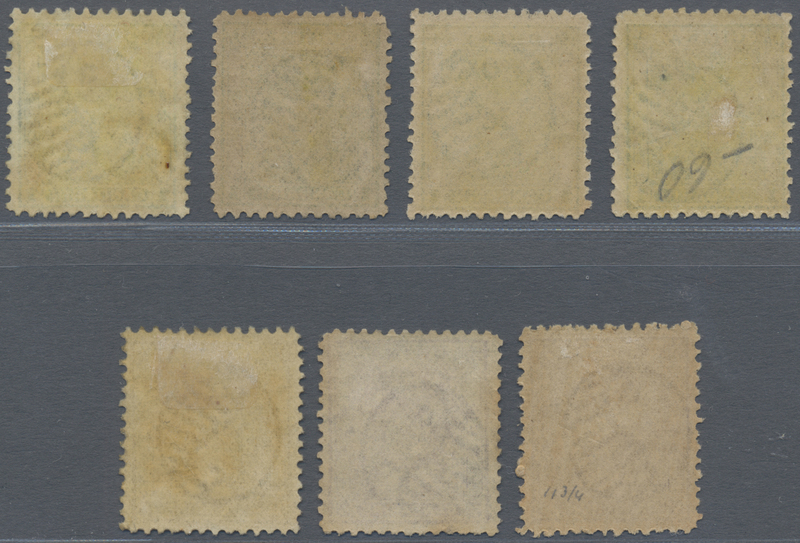 5681 ungebraucht (hinged) * 7a/15a 1894, dowager set 1 Ca.-24 Cn., unused mounted mint, the 24 Cn. may be even MNH (Michel cat. 2635.-). 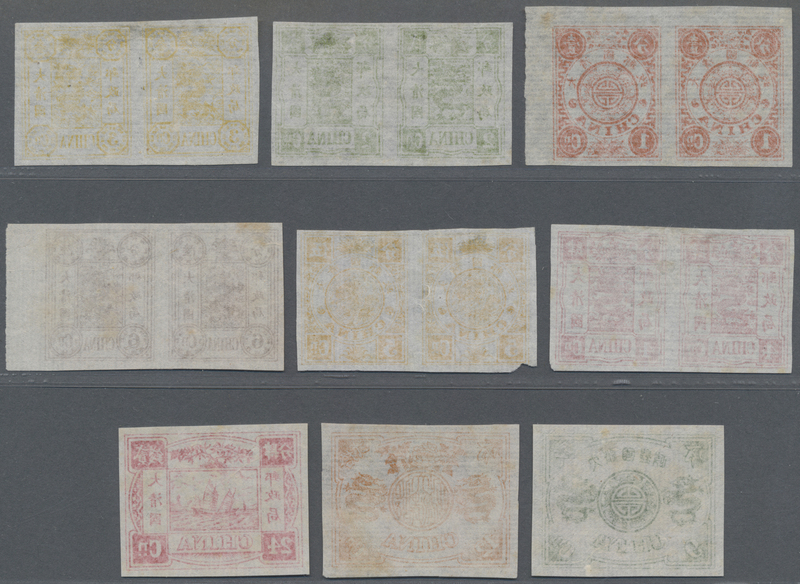 5682 ungebraucht ohne Gummi (unused without gum) (*) 7a/15a proofs 1894, Dowager set, first printing, proofs: on very thin laid paper, complete set, the 4 Cn. and 12 Cn. 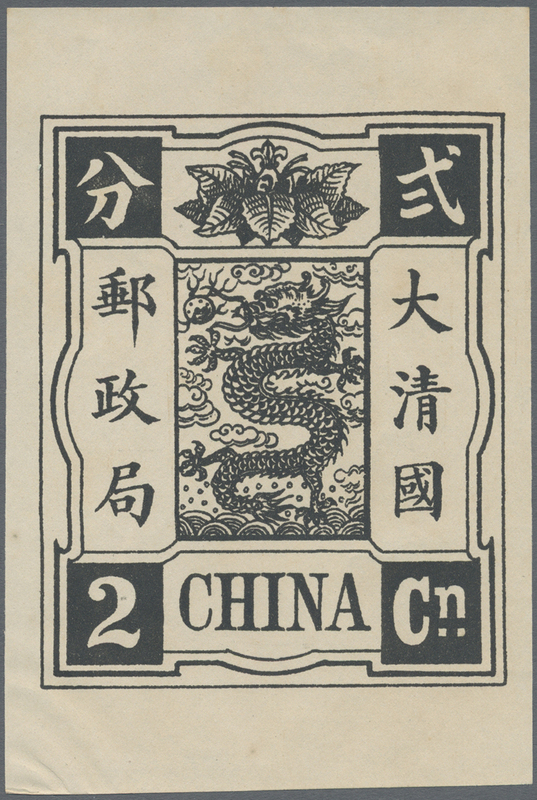 beeing vertical bottom margin pairs plus an extra single corner margin copy of the 12 Cn. 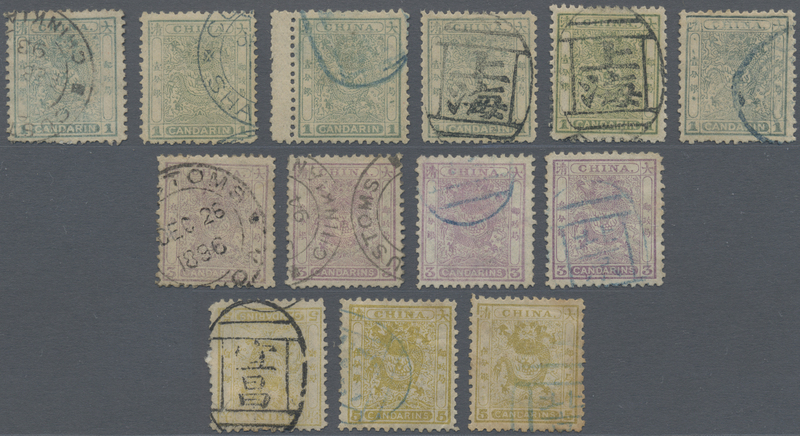 5684 7b/12b proofs 1894, Dowager set, 2nd printing, proofs: on very thin laid paper 1 Ca., 2 Cn., 3 Cn., 5 Cn. and 6 Cn. Total 5 copies, ungummed. 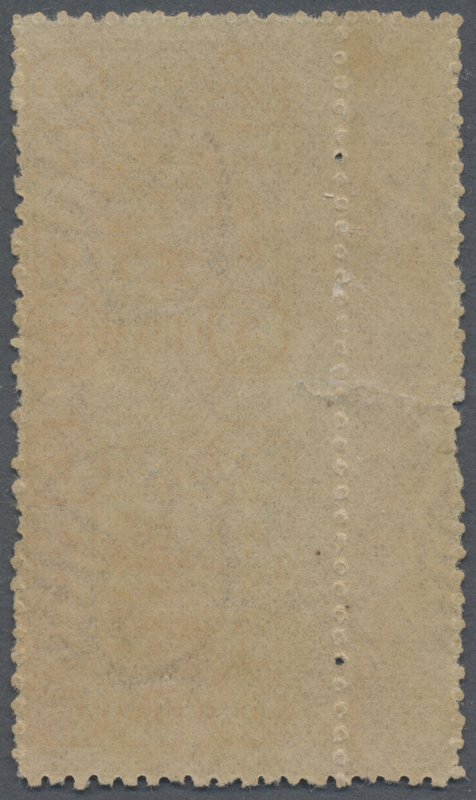 5685 ungebraucht ohne Gummi (unused without gum) (*) 7b 1894/97, dowager 2nd printing, 1 Ca. reddish orange, unused no gum (Michel cat. 650.-). 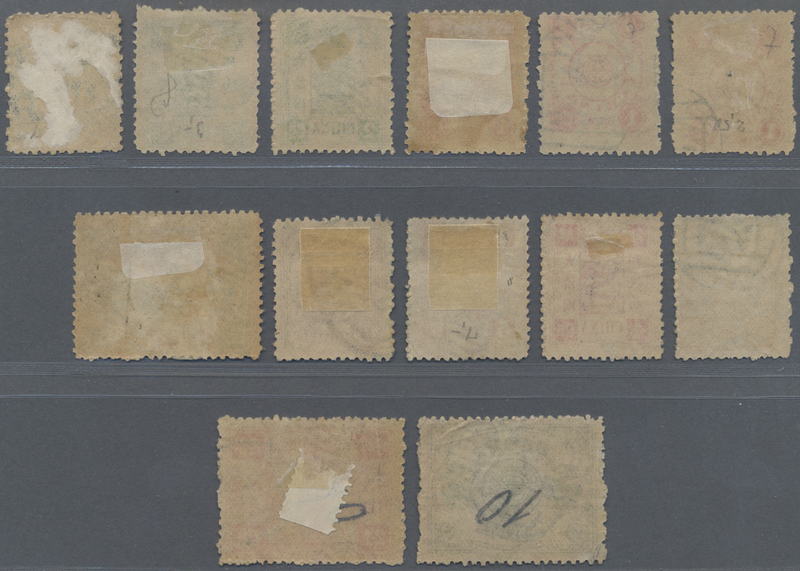 5690 ungebraucht ohne Gummi (unused without gum) (*) 4er (Block) 9c 1897, dowager 2nd printing 3 Cds. 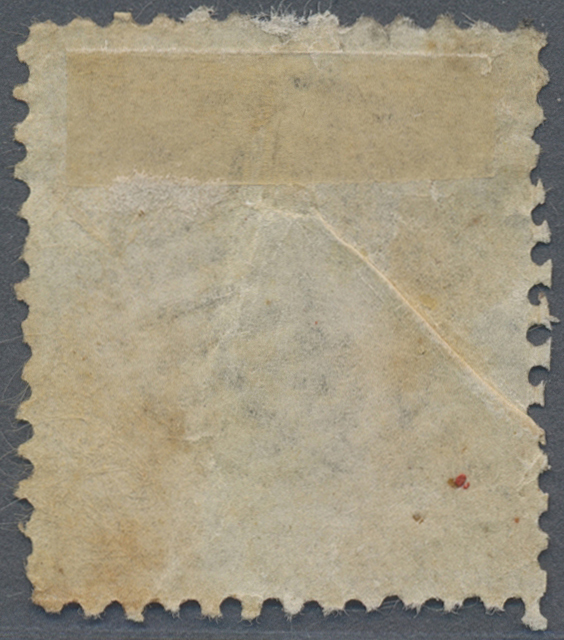 lemon, dry printing, a block of four, unused no gum, bottom scissor separation. 5692 Brief (cover) 10a, 11a etc. 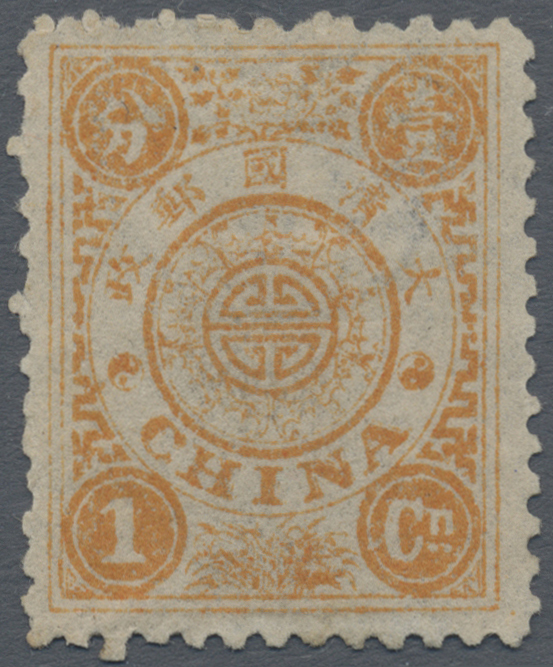 1894/98, dowager 4 Cn., 5 Cn. 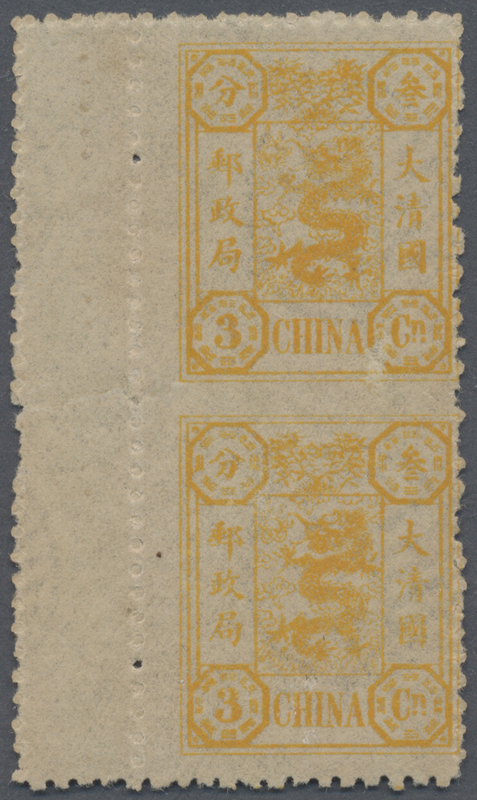 with coiling dragon 5 C. (2, part oxidized), 10 C. tied bisected bilingual "LUNGCHOW 31 JUL 02" in combination w. French Indochina 50 C. (tiny fault) tied "LANG SON 1 AOUT 02" to registered cover via Haiphong to Germany w. arrival "LICHTENTHAL 14.9.02".